Morfa Harlech is the more northerly of the two major sand dune systems that extend along the Meironydd coastline from the Mawddach Estuary in the south to Black Rock Sands in the north. The sand dunes here are unstable and still 'shifting' - a process where sandy deposits are blown inland creating new dunes and re-shaping those immediately behind which have not had time for stablising plants - Marram Grass, for instance - to become established. The process of new dunes forming can be very speedy, and the rate at which sand is blown inland on windy days means that one of the boardwalks laid at Morfa Dyffryn to the south of Morfa Harlech can be covered in a matter of hours, necessitating its removal each autumn in order to prevent it from becoming submerged by tons of sand during the winter. The habitats created by shifting dune systems are unique. Although they may look bare and inhospitable to us, they are home to some very specialised plants and animals that need this strange environment. These same plants and animals cannot live in the more mature dunes once increasing numbers of plants become established, and so their survival is dependent on Morfa Harlech and Morfa Dyffryn remaining in such a state that new dunes are continually being established. The special features for which Morfa Harlech and Morfa Dyffryn received such a high level of conservation designations include not just the sand dunes but also the associated seashore, saltmarsh and grassland habitats each of which is home to many wildlife species. Morfa Harlech NNR is managed by Snowdonia National Park Authority. The best way to access Morfa Harlech is directly off the A496 road between Barmouth and Maentwrog. 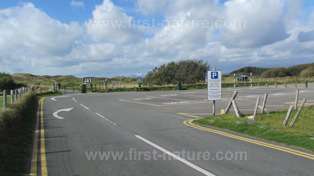 The turn towards the car park for Morfa Harlech is almost opposite Harlech Castle. Proceed along this road until you reach the Snowdonia National Park pay-and-display car park, which is at the end of the road. It is then just a short walk along a path to the sand dunes and beach. Do take care because the access path runs right through the middle of the local golf course, which can be very busy in good weather. there, and also to avoid disturbance of ground-nesting birds. There is an interpretation board beside the path that leads to the beach and dunes, and there are public toilets in the car park. For those among us who mainly confine their activities to the beach at Morfa Harlech, or who may venture inland only as far as the first and second 'tiers' of sand dunes (so called 'embryonic' and 'yellow' dunes respectively), to be confronted with a list of the plants that inhabit the NNR would come as quite a surprise! The dunes closest to the beach appear barren and devoid of plantlife except for a few patches of Marram Grass, which is one of the first plants to colonise new sand dunes. In spring and early summer Morfa Harlech is brightened up by dazzling displays of wildflowers, including numerous wild orchids. The species found in the NNR include Common Spotted-orchid (Dactylorhiza fuchsii), Heath Spotted-orchid (Dactylorhiza maculata), Marsh Helleborine (Epipactis palustris) and Northern Marsh-orchid (Dactylorhiza purpurella). 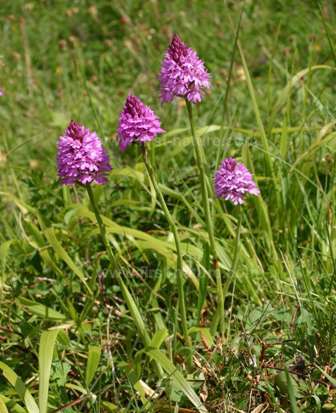 All three colour varieties of Early Marsh-orchid (Dactylorhiza incarnata) also put in an appearance on the reserve, but one of the most beautiful of the orchids that you can see at Morfa Harlech is the Pyramidal Orchid (Anacamptis pyramidalis). Iin a good year these orchids parade in their thousands in Wales's coastal nature reserves. Their name derives from the distinctly pyramidal (or more strictly, conical) form of the flower head in the early stages of opening; however, and somewhat confusingly, they later become decidedly egg-shaped. To list all the wildflowers that appear in Morfa Harlech in summertime would make this an impossibly long web page, but early on in the season Yellow Flag Irises (Iris pseudacorus) bloom in the damp dune slacks. Thrift (Armeria maritima) and Common Centaury (Centauria erythraea) also appear, and they are soon followed by other coastal species including Lady's Bedstraw (Galium verum), Tormentil (Potentilla erecta), Common Restharrow (Ononis repens, Wild Pansies (Viola Tricolor), Bird's-foot Trefoil (Lotus corniculatus) and many others. An unusal plant that flowers at Morfa Harlech later in the summer is Round-leaved Wintergreen (Pyrola rotundifolia), which is thriving in several nature reserves on the coasts of Wales. Portland Spurge (Euphorbia portlandica) is another plant, becoming scarce in the UK, that still has strongholds at Morfa Harlech and Morfa Dyffryn. 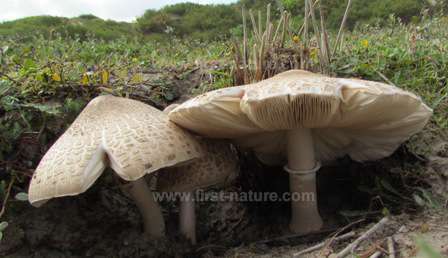 Below: Agaricus mushrooms species are abundant in the sand dunes in autumn. The dune slacks are also excellent places in which to see fungi in autumn. Some very interesting species have been recorded from both Morfa Harlech and Morfa Dyffryn, including various bird's-nest fungi (Cyathus and Crucibulum species), several waxcaps (Hygrocybe species) and various puffballs (Lycoperdon perlatum, for example). In a year with plenty of rainfall in late summer, impressive displays of fungi start to appear in early September and the pageant continues until the first really hard frosts of winter despatch the fungi, along with the flowers, for their winter rests. Where there are plenty of wildflowers there are inevitably also lots of insects. 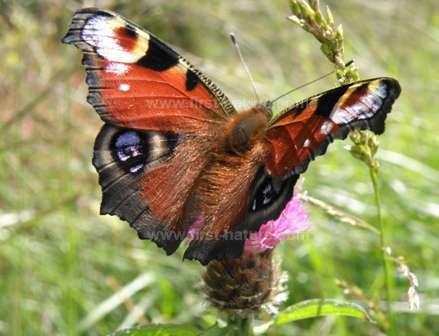 Morfa Harlech is a great place to see a wide diversity of species, and particularly butterflies. Silver-studded Blue (Plebejus argus), Small Copper (Lycaena phlaeas), Peacock (Inachis io), Marsh Fritillary (Euphydryas aurinia), Gatekeeper (Pyronia tithonus) and many more have been recorded from Morfa Harlech. 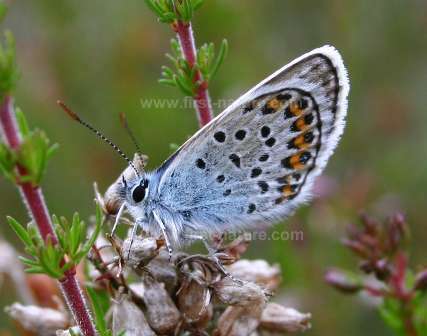 Below: The Silver-studded Blue Butterfly is one of many species found at Morfa Harlech. Morfa Harlech also supports populations of breeding birds, including Whitethroats (Sylvia communis), Skylarks (Alauda arvensis), Wheatears (Oenanthe oenanthe) and Sedge Warblers (Acrocephalus schoenobaenus). Lapwings (Vanellus vanellus), now so reduced in numbers throughout Wales and indeed the rest of the UK, nest on the saltmarsh in the area, while other rare bird species that put in appearances at the reserve include Choughs (Phyrrocorax phyrrocorax) and Hen Harriers (Circus cyaneus); the latter are known to roost in the small area of reedswamp at nearby Morfa Dyffryn. Among the passage wading birds that use the beach and estuary at Morfa Harlech and Morfa Dyffryn are Sanderlings (Calidria alba), Ringed Plovers (Charadrius hiaticula), and Turnstones (Arenaria interpres) - once included with the plovers but are now classified with the sandpipers (Scolopacidae). This wonderful part of Wales has so much to offer the wildlife enthusiast, so don't be put off by the seemingly endless string of caravan and camping sites along the edge of the beach. 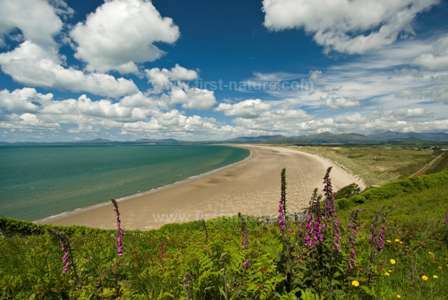 The protection afforded to a large area of this magnificent coastline by the wonderful nature reserves of Morfa Harlech and Morfa Dyffryn ensures that there is still plenty of room for the wildlife that lives there. A very short walk off the beaten track into the dune systems takes you into a quiet world that feels a million miles from sandcastles, candyfloss and amusement arcades!